Take a walk on the west side river walk starting at Battery park where well over 100 Linden Trees line the way. They are in bloom and the aroma is nothing short of heavenly. I smelled this hauntingly unfamiliar aroma the first time at Vin Expo in Bordeaux when I was walking in the park. The trees also line the Bahnhof Strasse in Zurich. I asked a park attendant by the west river if she knew what the trees were (though there was little doubt in my mind) and she said oh yes--Linden--a German woman told me the other day they come from Germany and they used to make tea from blossoms. They should make perfume! The tree is from the Tilia family which would explain how Terry Thiese, the German wine importer, came to describe a wine ini his catalogue as tilulial--a word he made up and for which much effort was required to find the definition. My great aunt Polly lived in Riverdale in an apartment complex called Linden House. 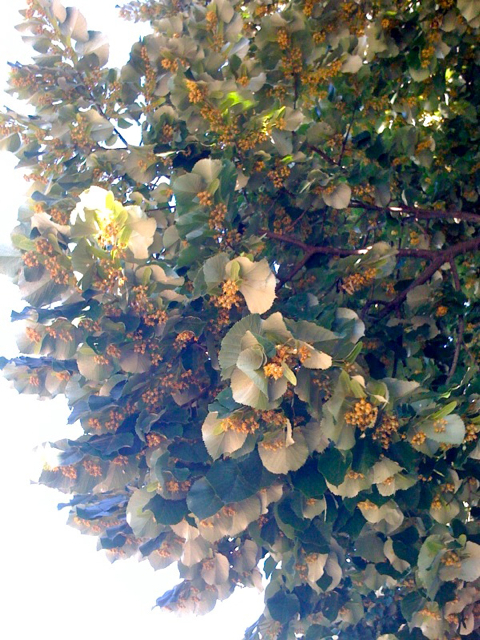 I suppose there must have been Linden trees but of all the many times I visited her I never smelled any blossoms. I would have remembered.